Ashleigh’s family is a little messed up. She is fifteen and feels that life has slipped out of her control. After her latest ‘escapade’ Ashleigh is sent to do volunteer work in a daycentre for the disabled. It is here that she meets Joyous who opens her eyes to a new perspective on life. He teaches her to massage the bad to discover the good parts of life. 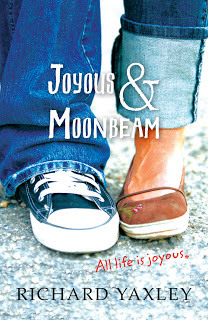 ‘All life is joyous, and even the bad bits can be worked around a little.’ He calls her Moonbeam. In return, Ashleigh gives him respect, trust and companionship. These two unlikely friends have much to teach each other about life, right when they both need it the most. Joyous has the desire and courage to keep his faith. This belief saves Joyous and gives him a rhythm without which life would be random and his world out of control. Rhythm is how he creates order. His belief system of working things around a little is one of the things Ashleigh desperately needs in her life. One of Ashleigh’s favourite quotes is a line from a Katy Perry song Fireworks – ‘After the hurricane comes a rainbow’ and she is trying to believe in this. As she learns from Joyous, Ashleigh realises that ‘caring for Joyous has pulled me back from the edge. That’s how it is with rainbows’. This story was hard to get into initially. It is not an easy read. But it is a rich and rewarding one. It demands your attention, then gives back much to think about, with new perspectives on how life works and the cards that are dealt. The intriguing nature of the story creeps up slowly, but once you realise you are hooked it is unputdownable. The language, while difficult at first, is almost like poetry. The chapters are told alternatively by three characters, Joyous, Ashleigh and Joyous’ mother, all in the first person with voices so distinctive there is never any confusion about who is speaking, even without quotation marks or tags. Joyous uses wonderful made up words such as sparklous, dandiful and bouciful and in context there is never a question about what he means. There is a lot I would love to quote from this book. So much wonderful language, so many uplifting moments and so many rays of light and hope are present throughout its pages. I hope many young adults and adults alike read this story and get as much pleasure from this story as I did.